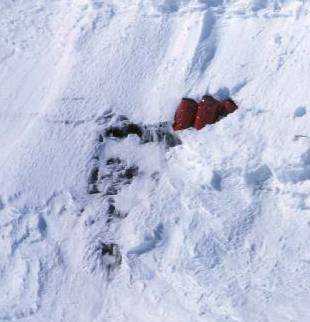 By sheer chance (randomly Googling something aviation-centric) I found the Z50 site and report of your reunion in October 2006.� I was one of the over-wintering FIDS at Halley in 1973, when Roger Daynes was base commander. I remember particularly Dave Habgood and his bendy pipe and a memorable visit to the Gin Bottle, and Colin Cuthbert, amongst others. Like most FIDS of the time I have a vast stack of photos and 8mm movie, and my daughter (now 26) has asked to take possession of same with a view to digitizing them. Interesting times. 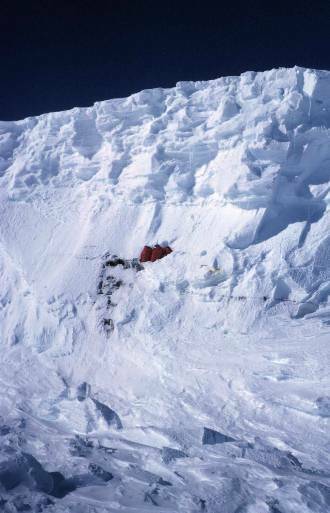 Buried 1961 campsite visible in ice cliff at Halley. It eventually floated out to sea in an iceberg. From the BAS image library ref: 10007269; used with permission. No unauthorised copying. This picture was taken during the 1972-73 summer season though it is not known exactly where. Thanks to Kathy Hayes for providing it. Kathy says the site could have been exposed as a result of the calving event of September 1971. Click on the picture for an enlarged detail.